A month and a half after Cingular launched it, T-Mobile USA also announces the second generation of RAZR phone, named V3t instead of V3i, but packing the same features in the same design. Coming in dark-grey housing it is pretty standard, but the second GSM carrier in the states also shows the limited Dolce and Gabbana edition of the V3i for a few bucks more. The V3t and the V3i D&G are available for $150 and $300 respectively after discounts and rebates. 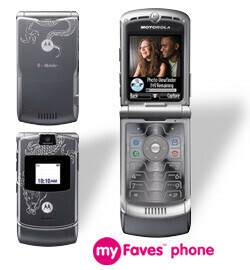 In addition, the carrier also launched a couple of colorful tattooed versions of the original RAZR: Cherry Blossom Tattoo and Dragon Tattoo, both available for $90 after rebates. 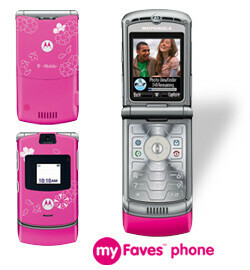 All the four new RAZR phones are coming with myFaves and are already available for purchase from the carrier's website. 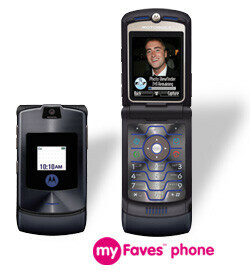 You can read the Complete Motorola RAZR V3i Review here.